Rod Giltaca, President of Canada’s leading gun lobby the Canadian Coalition for Firearm Rights (CCFR) compared a gun safety advocate to Nazi Joseph Geobells. Giltaca deleted the tweet but a screenshot was preserved. The tweet came in response to a gun activist posting a Washington Post article explaining how Canada’s gun lobby orchestrated a campaign to attack and discredit members of the Canadian Doctors for Protection from Guns, a grassroots organization of doctors working to strengthen Canada’s gun laws. 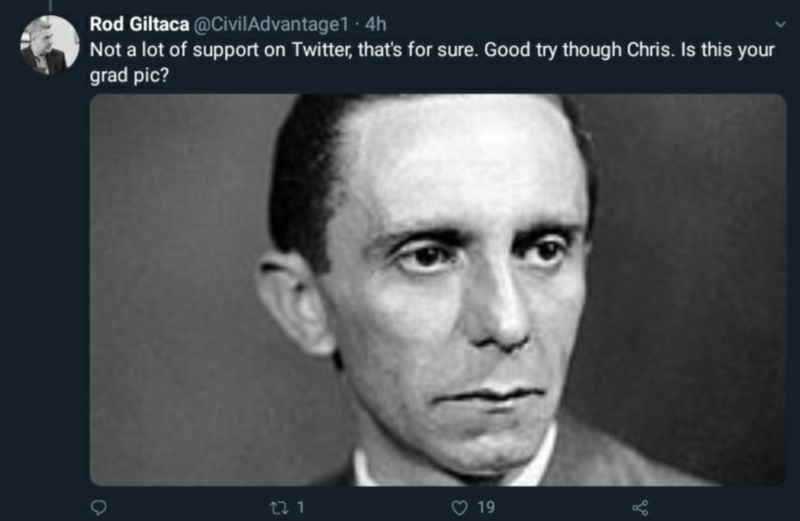 Giltaca’s comments were heavily criticized online, with users pointing out how his message diminished the 6 million Jews killed in the holaucust.